Man, I love serendipity … all along I had planned on including the Pillar of Eliseg as one of the sites in St Cybi’s Well. It was one of the first places I saw in Wales, and I’ve always loved it and the nearby Valle Crucis Abbey. Well, they’ve recently discovered that there is an Early Bronze Age cist under the medieval ‘pillar’ — something which I also wanted to include for other reasons related to the story. Now, the protagonist of this novel — Darnell Sidwell — lives in Tel Aviv, and we know from Communion of Dreams that he has some history doing volunteer work on archeological digs in Israel. So I checked the Wiki entry for Tel Aviv University, found a member of their archeology faculty who it would be logical for Darnell to have known and volunteered for. I just like to have those sorts of details all accurate or at least plausible. Yeah, it’s part of the reason why this book is taking me so long to write. Anyway, I found a faculty member who fit the bill, and who is a specialist in the Early Bronze Age. Cool — everything worked out just fine. But in continuing to dig a little into that guy’s background and research, I found that he has done a lot of work at one particular site which it would be logical for Darnell to have also visited, if not actually volunteered there: Tel Megiddo, or often as just Megiddo. But you probably know it as “Armageddon“. Following the completion of my successful Kickstarter for St. Cybi’s Well in the Fall of 2012, I proceeded to make arrangements for a limited edition print run of Communion of Dreams to be bound by hand. See the Colophon on the dedication page of this book for details. However, there was an error at the printer’s with the first printing. In spite of having had a correct proof copy, the initial printing was done entirely backwards – laid out as though the book was intended to be read back-to-front, with the spine on the right side, and in which you turn the pages from left to right. At first I thought the entire print run would need to be recycled. Indeed, once the printer realized their error, that’s what they asked me to do with the printed sheets in order to save them the cost of shipping. Errors are part of the handmade process. In this case, the error wasn’t mine, but came from the printer. 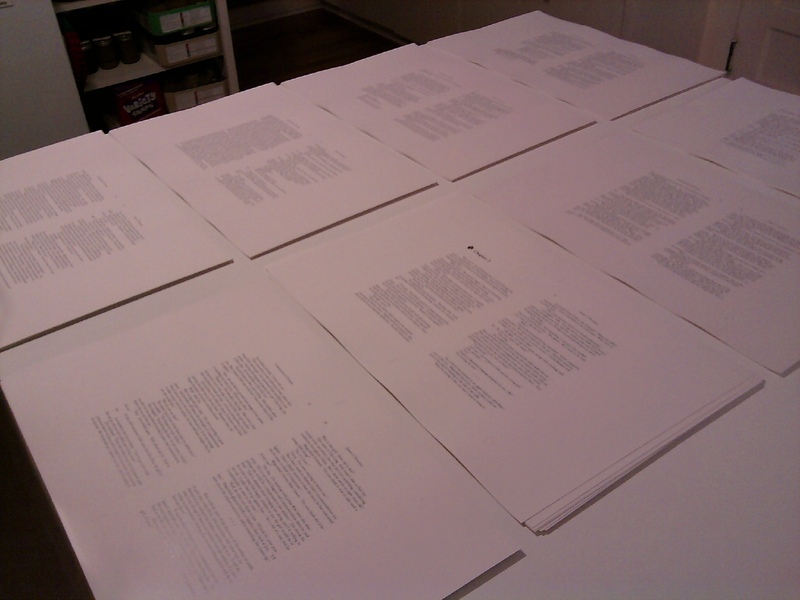 Whoever set up the print run managed to load the pages backwards, and in the process opened an unexpected door. When things like this happen, I’ve learned to roll with it. It’s like a little surprise, something special the universe gives you – serendipitous art. So I decided to hand-bind a few of these ‘backwards’ books, as curiosities. How many? 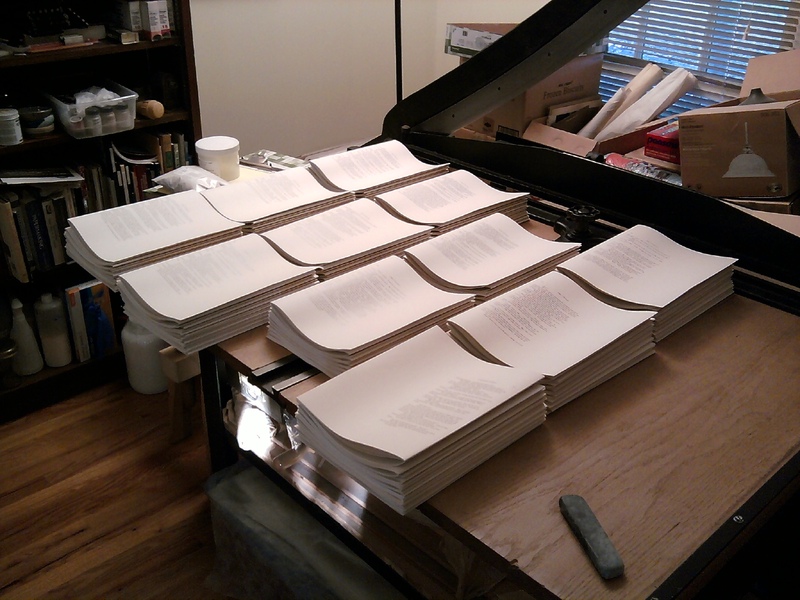 Just 15 copies – thirteen ‘lettered’ copies (A – M), and two artist’s/author’s proofs. This copy is letter _____. Add a designated letter, and my signature, and then those sheets will be the ‘paste-down’ sheets for the back cover — er, I mean front cover — of the backwards books. 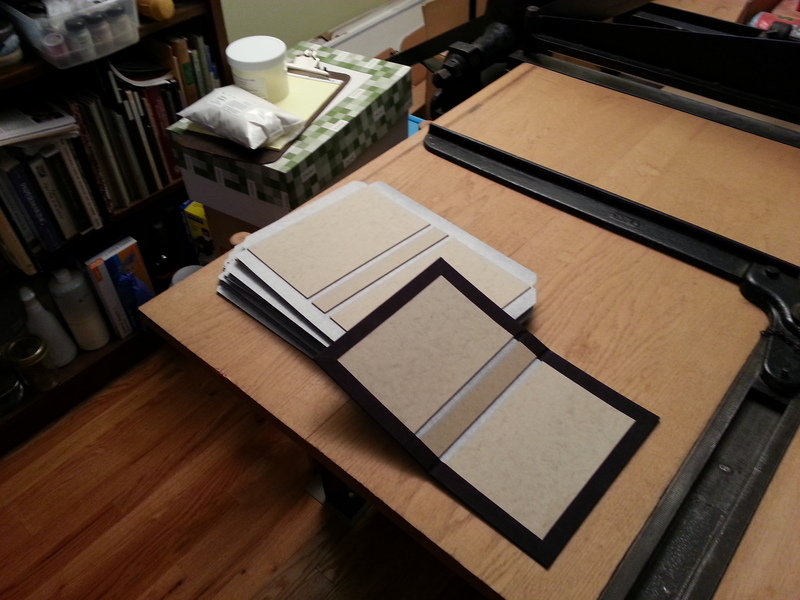 Yup, I’m all done with that little binding project. There are still 7 copies unclaimed, but now that they’re actually made I expect that they’ll find homes fairly soon. 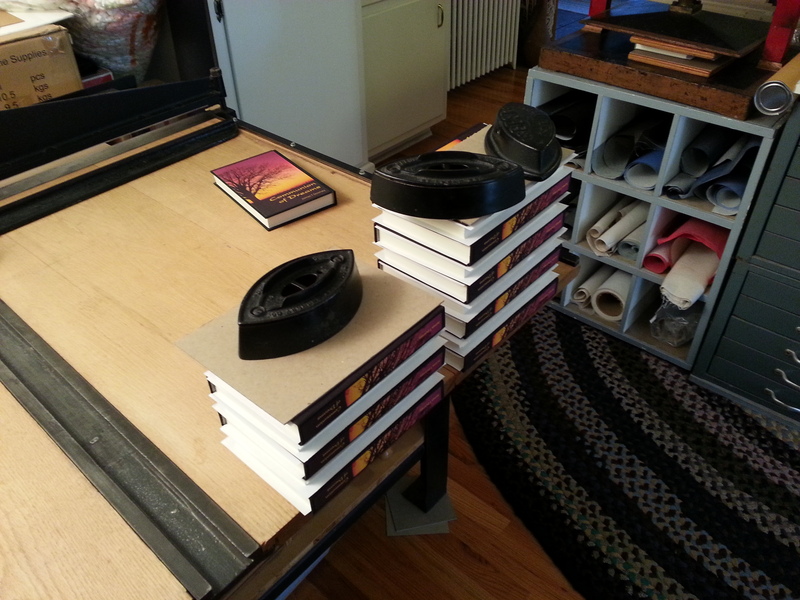 The little photo essay of making these books isn’t fundamentally different than the first set shown, but it’s kind of fun to see the larger volume of the whole process. Text blocks sewn, lined, stacked to dry. Making the covers. 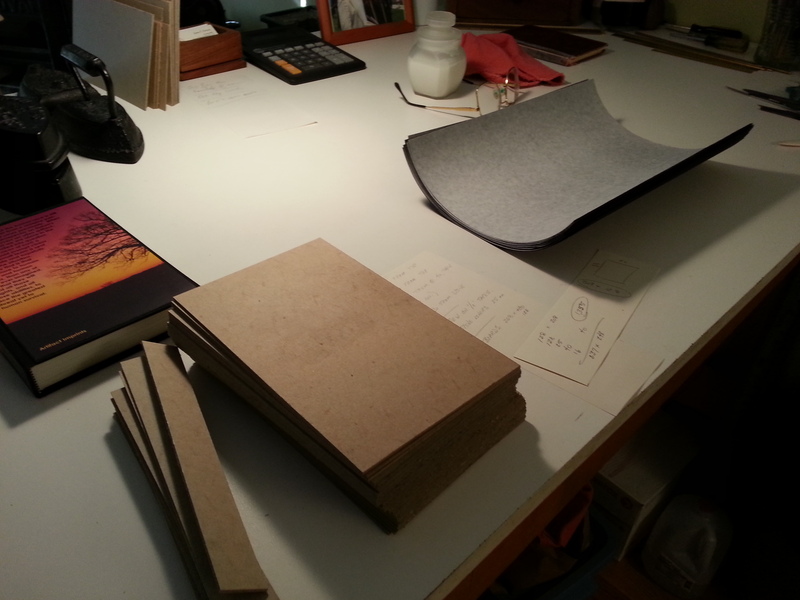 Note the stack of cut boards, the stack of cut pieces of book cloth. Boards mounted, turning in the edges & corners to finish the covers. 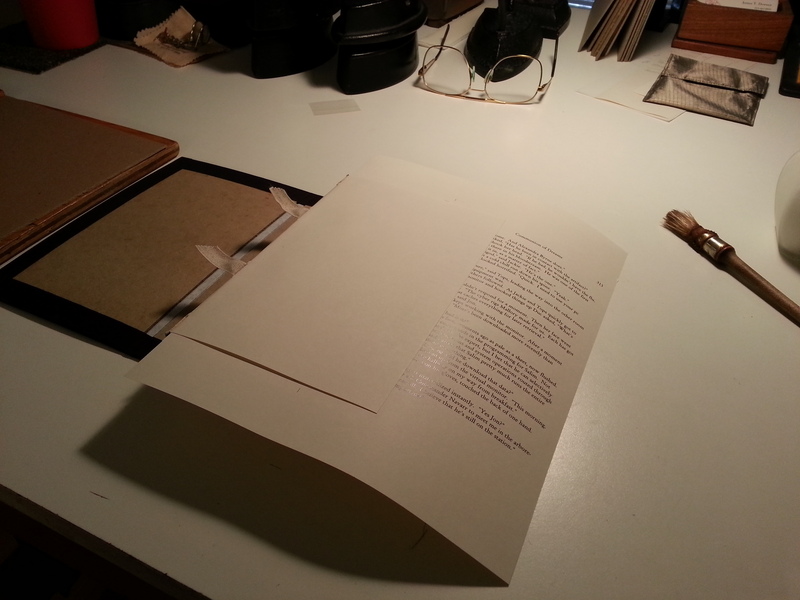 “Pasting in” – the process of mounting the text blocks to the covers. 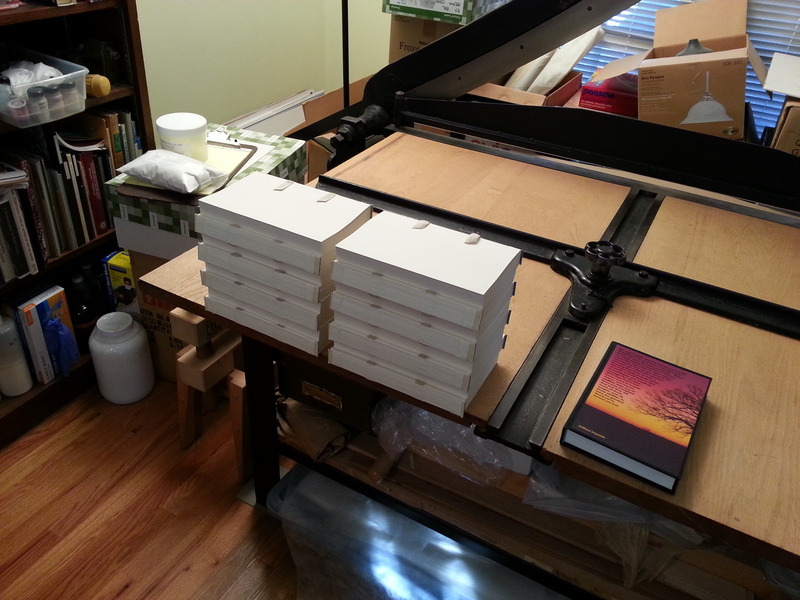 Finished books, stacked and drying.